We love Frittata in our house and I experiment with all different kinds of fillings. Here’s the one I whipped up for dinner tonight. 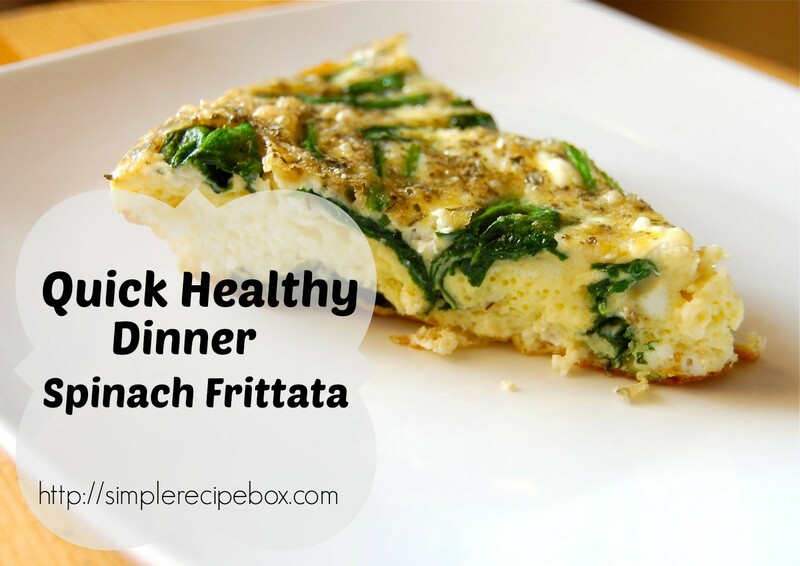 This is a quick healthy dinner for any night of the week, you can add whatever ingredients you like! Next, put the butter/oil in your pan and turn the heat to medium. When it’s warm add the garlic. Let it simmer for a couple of minutes, then add your spinach and cook until it’s just barely wilted. While that is heating up, mix together eggs, milk, cheese, salt, pepper, herbs and flour. Pour mixture over spinach, turn the heat down to low and cook for 10 minutes, or until the bottom of the frittata is firm. Don’t mess with it during this time, just let it do it’s thing. Transfer the pan to the oven and cook for 10-15 minutes checking on it every 5 minutes. What you’re looking for is the top to be slightly browned and not runny. Serve hot and enjoy!